New Mexico based experimental guitarist Jeff Gburek has been involved in a number of interesting projects: Orphan Sound System, Djalma Primordial Science, Zygoma, plus various collaborations and solo efforts. And after several home produced recordings, his first release on a label comes to us courtesy of Nur Nicht Nur as part of their Metal Box Series (the CD comes housed in a metal box). 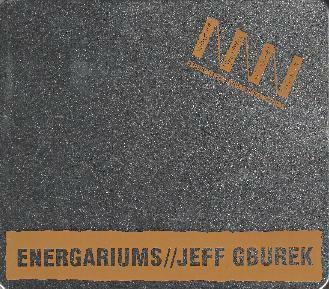 Energariums features Jeff on electro-acoustic guitar, field recordings, voices and other devices. The album consists of steadily evolving soundscapes, constructed with guitar and a banquet of sounds and efx . It's not always clear what is being produced by the guitar, but of course that's part of the beauty and fun of Jeff's music. Natural sounds are strategically and imaginatively placed, blended and weaved with those of his own invention to create a sonic experience that is simultaneously challenging and inspiring. My concentration was pleasantly jarred about 15 minutes into the set during "Energarium II". I had been drifting along with the motion of the music and atmospheric drones, when out of nowhere the traditional strum of the guitar came in. Only on the closing track, "Afghanopsis", do we hear an entire piece performed without manipulation or effects. "Oum Kas'r, Mother Of All Ports" may well be one of the most intense pieces of music I've heard all year, combining disturbing screams and howls with anguished guitar destruction. Quite a change from the relatively pleasant journey we had been on so far, as on most of the album Jeff draws from a far more subtle and understated sonic palette. "Improvisation I-III" are pieces I particularly enjoyed, with an emphasis on how each note is presented in succession, and the "attack" style of these notes, producing fascinating results. In summary, there's lots here for experimental free-improv fans to enjoy. The guitar's possibilities seem without limit in Jeff's hands, and you'll easily hear more with each return listen to Energariums. For more information you can visit the Djalma web site at: http://www.djalma.com. Visit the Nur Nicht Nur web site at: http://www.nurnichtnur.com. CLICK HERE to read the interview with Jeff Gburek in AI #24.